This British Council funded workshop aims to present the latest technologies that has been implemented for sustainable biofuels production. 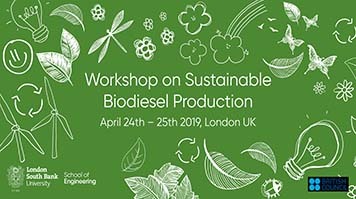 On behalf of Centre for Energy and Environment Research (CEER) at London South Bank University (LSBU), it is our great pleasure to welcome you to The British Council funded workshop on “Sustainable Biodiesel Production” at LSBU. We will bring together researchers from academia and industry, and provide a forum for discussion on challenges and benefits, exchange ideas and experiences, and explore possible future collaborations. The workshop will showcase invited talks by leading researchers who will provide insight into emerging technologies and discuss novel solutions to the critical obstacles for biodiesel production. The workshop will provide a great opportunity for early career researchers to obtain a foundation in the field and/ to update their knowledge on the latest technology and approaches for biodiesel production. This is a two day workshop with workshop starting at 11.30am - 6pm on the 24th April. One-night accommodation will be covered by the organisers (if participant is travelling from outside London) in addition to a gala dinner on the 24th April. The workshop will resume on the 25th April from 9am and concluding at 2pm. This session will be run on the first day afternoon after the refreshment break. If you are presenting a poster, it is important to print your poster in advance and arrive early to erect your poster. The poster boards will be numbered and you should follow instruction when you arrive. There are poster prizes for the best and runner up posters, selected by a judging panel. Prizes will be awarded at the closing session on the 25th April. Please confirm your participation by submitting an abstract of the poster. Please note that abstracts must be sent by email to Omar Aboelazayem by 4th of March. We are pleased to offer almost free registration for all participants (only £10 + Fee for attendance confirmation). Early career researchers are highly recommended to register for the workshop. Places are very limited and will be offered first come first served. Full programme will be confirmed closer to the time of the workshop. If you would like to attend this workshop, please send your request email to Professor Basu Saha and include your name, affiliation, position, academic qualification and write 'Request to attend Biodiesel Workshop' as the subject in the email.